In an exclusive interview, Mgr Vincent Nguyen Van Ban, the newly-consecrated bishop of central Vietnam, talks about his episcopacy’s priorities: poverty, health care and minority rights. Traditional songs and readings in local languages enliven the ceremony. Ban Me Thuot (AsiaNews) – As he gets ready to take on his Episcopal mission, Mgr Vincent Nguyen Van Ban, the newly-appointed bishop of Bam Me Thuot, told AsiaNews that his main goals include entrusting the guidance of the diocese to God, “believing in Him and relying on His help.” Other priorities are working with local “priests, nuns and the laity” to renew the mission of the local Church whilst at the same time promoting “social and pastoral activities” on behalf of the faithful, who are mostly ethnic minorities, especially Montagnards living in central Vietnam’s plateau region. 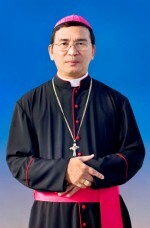 Mgr Nguyen Nhu The, archbishop of Hue, presided over the ceremony that consecrated Mgr Vincent Nguyen Van Ban bishop; Pope Benedict XVI had appointed him to the post last 21 February. Altogether 26 diocesan bishops, over a hundred priests, 500 nuns and at least 5,000 lay people took part in the ceremony. “I come to work with priests, nuns and lay men and women who have a long experience with the local situation,” the new bishop said. For this reason “I am but a ‘student’ who wants to learn” and intends to “focus his attention on the educational work of priests, nuns and lay men and women”. The new prelate plans to devote special attention to the ethnic minorities who call the region home. The Word of God has been translated in Vietnamese as well as local languages so that the catechesis can be taught to local residents. During the consecration ceremony the Ede language, which is typical of the central plateaus, was used in songs and readings. Mgr Vincent Nguyen Van Ban was born on 25 November 1956 in Tuy Hoa Parish, Phu Yen province, diocese of Qui Nhon, and was ordained priest on 16 September 1983. Last October he spoke as an expert participant during the Synod of the Word in the Vatican. As his Episcopal motto he chose “Live With the Spirit” (Gal, 5:16). The diocese of Bam Me Thuot is located in the central plateau of Vietnam with about 2.5 million people divided into 40 different ethnic groups. Catholics constitute about 10 per cent of the population and are served by 120 priests, about 400 men and women religious, 50 major seminarians and 3,544 catechists operating in 88 parishes and 58 ‘small communities’. The vast territory is covered in forests and the weather is favourable to malaria. Evangelisation in the region was renewed in earnest with the arrival in 1948 of Brother F.X. Nguyen Do, who was instrumental in spreading the Gospel among local minorities.